Although USB 3.0 is already available, a lot of people are still using somewhat older computers. 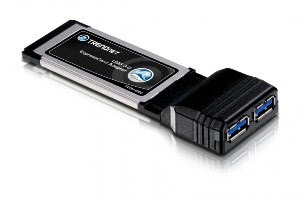 In order to benefit from the speeds of up to 4.8Gbps, TRENDnet launched a USB3.0 adapter with a 2 port Express Card Module (TU3-H2EC) for laptop computers and 2 port PCI-Express adaptor (TU3-H2PIE) for desktops. It is worth mentioning that the new USB3.0 adapter can be plugged into any Express Card slot on your Windows-running laptop. The TU3-H2EC also comes with a power adaptor that can be used to power your USB 3.0 devices. As for the windows-based desktops, you will be able to connect the adaptor to any free PCI-Express slot on the computer. It would be interesting to note that the TU3-H2EC is backwards compatible to USB 2.0, which means that your older USB devices will still function. If you want to buy a TRENDnet TU3-H2EC USB3.0 adapter for laptop, you will have to spend $ 62.99 and if you want a TRENDnet TU3-H2PIE USB3.0 adapter for PC, then prepare to spend $ 50.99.